A Louisville resident, Mr. Herman David Bishop, age 70, passed away Monday, October 22, 2018 at his residence. He was born September 21, 1948 in Spencer County to the late Herman and Margie Maddox Bishop. 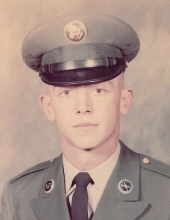 David was a retired construction worker, a United States Army Veteran and a member of Plum Creek Baptist Church. He is survived by his sister, Carolyn (Bobby) Shaw of Mt. Washington, his niece, Judy (Dennis) Bennett of Hardinsburg, KY., 2 great nephews, Nathan and Nicholas Bennett, and his companion, Sylvia Carey of Louisville. Funeral services for Mr. Herman David Bishop will be 2:00 pm Sunday, October 28, 2018 at the Greenwell-Houghlin Funeral Home. Bro. Jon Rohr will officiate. Interment will be in Valley Cemetery. Visitation will be Saturday from 1:00-8:00 pm. The Greenwell-Houghlin Funeral Home of Taylorsville is in charge of arrangements. To send flowers or a remembrance gift to the family of Herman David Bishop, please visit our Tribute Store. "Email Address" would like to share the life celebration of Herman David Bishop. Click on the "link" to go to share a favorite memory or leave a condolence message for the family.